Over this past fall and winter, I was acclimating to a new job that was almost completely writing-based. I enjoyed it immensely, but was dealing with depression and fatigue at the same time, and so I stopped blogging and writing poetry, essays and fiction for nine months. I'm here to tell you, I needed that break. And here I am ready to step back into the blogging world again. I also intend to slowly add back in my other writing projects. 1. It's OK to take a breather. Unless you are facing a book deadline, which I wasn't, you'll find that it's actually quite easy to disentangle yourself from most types of writing. And no matter how much it hurts your heart, if you are burned out, you need the break. Cut yourself some slack. 2. Your blogging friends will still be here when you get back. This was a hard one for me, but I didn't comment on other blogs during my furlough. I simply enjoyed Facebook as a means of keeping up with friends and families' lives, and didn't worry about sticking to "online generosity" of reading, liking and commenting on my friends' blogs. Now that I'm back to blogging, I expect to start re-engaging with my blogger buddies. 3. No one will fault you for taking a break. And if they do, it's their problem, not yours. You know what you need in this season. Keep calm and stick to your guns. 4. You might be surprised by how refreshed your creativity will be post-break. Already my journal is much more interesting to read (if I were to let anyone else read it!) and I'm regaining ideas for blog posts and other types of writing. 5. Even if your break is shorter, you still need days off. This will probably not surprise you. 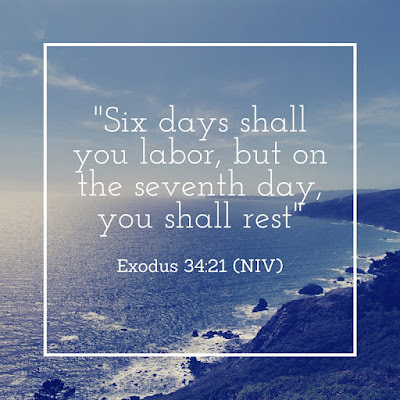 You are a human, not a machine, and the Bible says, "Six days shall you labor, but on the seventh day you shall rest; even during the plowing and harvest season you must rest." (Exodus 34:21, NIV) See, even the animals need rest. Now, happy writing, but also happy resting!